Angela Evelyn Bassett (born August 16, 1958) is an American actress and activist known for her biographical film roles, most notably her performance as Tina Turner in the biopic What's Love Got to Do with It (1993), for which she was nominated for the Academy Award for Best Actress and won the Golden Globe Award for Best Actress – Motion Picture Comedy or Musical. Bassett has additionally portrayed Betty Shabazz in both Malcolm X (1992) and Panther (1995), Katherine Jackson in The Jacksons: An American Dream (1992), Voletta Wallace in Notorious (2009) and Coretta Scott King in Betty & Coretta (2013). Her other roles include Rachel Constantine in Contact (1997), Amanda Waller in Green Lantern (2011), Lynne Jacobs in Olympus Has Fallen (2013) and London Has Fallen (2016) and Queen Ramonda in Black Panther (2018). Bassett began her film career in the mid-1980s, after earning a bachelor of arts degree from Yale University and a master of fine arts degree from the Yale School of Drama. In the 1990s, she appeared in films nearly every year. The 2000s saw a succession of films starring Bassett, with her appearing in at least one film every year. Bassett's success has continued into the 2010s. 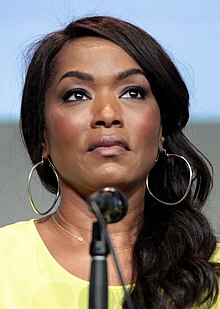 Bassett earned nominations for her roles in films such as The Score (2001), Akeelah and the Bee (2006), Meet the Browns (2008) and Jumping the Broom (2011) and won awards for her performances in How Stella Got Her Groove Back (1998) and Music of the Heart (1999), among others. Bassett's performance as Rosa Parks in the 2002 film The Rosa Parks Story was honored with her first Primetime Emmy Award nomination. In 2013, Bassett had a recurring role on the FX horror anthology series American Horror Story: Coven, earning her second Primetime Emmy Award nomination for her performance as Voodoo queen Marie Laveau. She returned for Freak Show, the series' fourth season, portraying a three-breasted woman named Desiree Dupree, for which she received another Emmy Award nomination. For the fifth season, Hotel, she portrayed Ramona Royale, a famous movie star. Bassett returned to the series's sixth cycle, Roanoke, portraying an alcoholic actress named Monet Tumusiime, who plays struggling mother and former police officer Lee Harris in the My Roanoke Nightmare documentary, and she reprised her role as Marie Laveau in a guest role in the eighth season Apocalypse. In 2018, Bassett began producing and starring in the Fox first responder drama series 9-1-1, playing LAPD patrol sergeant Athena Grant. Bassett was born on August 16, 1958 in New York City, the daughter of Betty Jane (née Gilbert; 1935–2014) and Daniel Benjamin Bassett (1924–1981), and was raised in Harlem. Bassett's middle name was given to her in honor of her aunt Evelyn. The origin of the Bassett surname comes from her great-grandfather William Henry Bassett, who took the surname of his former slave owner. Ten months after Bassett was born, her mother became pregnant and had a second child, Bassett's sister D'nette. Bassett said the pregnancy "only made things harder." Bassett's parents "shipped" her to stay with her father's sister Golden. While her aunt did not have any children of her own, she "loved children, and she was good with them." After her parents' separation, she relocated from Winston-Salem, North Carolina, to St. Petersburg, Florida, where she and her sister D'nette were raised by their social worker/civil servant mother. Bassett did not see her father again for several years, until she attended her grandmother's funeral. There, Bassett met his daughter from his first marriage, Jean, who at twelve years old, was several years older than Bassett. After graduating from Jordan Park Elementary School, she began being bused out of her neighborhood to attend Disston Middle School for seventh grade. The year she began attending was 1970, the first year busing was implemented to integrate public schools in St. Petersburg. After completing seventh grade, she was bused to Azalea Middle School for eighth and ninth grade. Bassett's mother became more involved in her daughter's grades and told her and her sister the pair were going to college. At Boca Ciega High School, Bassett was a cheerleader and a member of the Upward Bound college prep program, the debate team, student government, drama club and choir. A straight "A" and "B" student for the most part, Bassett got her first "C" in physical education, and tried to get her mother to not feel disappointment in the grade. Bassett called the grade the "average," leading her mother to say that she did not have "average kids." As Bassett described, a "sense of pride" developed in her and she did not get another "C" until college. During high school, Bassett became the first African-American from Boca Ciega to be admitted to the National Honor Society. She participated in Upward Bound, an academic and cultural enrichment program for underprivileged students. Bassett says she and the other participants did not see themselves as underprivileged. She appeared in the 2008 film Gospel Hill. Stephen Holden of The New York Times wrote that Bassett's "fiery self-possession brings a spark of passion to her stick-figure character". She next appeared in Of Boys and Men, portraying Rieta Cole, the matriarch of a Chicago family who is killed in an accident in the beginning of the film and is seen through flashbacks for the remainder of the film. She and her costars Robert Townsend and Victoria Rowell were seen by Robert Gillard of LA Sentinel as doing wonderful jobs of "capturing the emotions of a family stricken by grief." Bassett also had a role in Nothing But the Truth in 2008. Bassett joined the regular cast of ER for the show's final season (2008–2009). She portrayed Dr. Catherine Banfield, an exacting Chief of the ER who was also working to recover from the death of a son and to bring another child into her family. 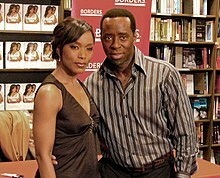 Bassett's husband Courtney Vance played her television husband on ER as Russell Banfield. In January 2018, Bassett starred in the Fox first responder procedural drama 9-1-1, of which she is also a producer. In February 2018, Bassett starred in the acclaimed Marvel superhero film Black Panther, as Dowager Queen Ramonda, mother of the titular character. Bassett has been noted for portraying real life African-American women, usually smart and strong women. Bassett said in 2001 that she liked those roles and added: "That's the image that I like to put out there, and those are the parts I'm attracted to. But not iron-fist kind of strong, just self-assured. I'm nice too." She has turned down roles which she viewed as demeaning to her image. "This is a career about images. It's celluloid; they last for ever. I'm a black woman from America. My people were slaves in America, and even though we're free on paper and in law, I'm not going to allow you to enslave me on film, in celluloid, for all to see. And to cross the water, to countries where people will never meet people who look like me. So it becomes a bigger thing than me just becoming a movie star, and me just being on TV. So if you're going to show every black woman as 400lb or every black woman as the prostitute on the street ... But I have always maintained that [the roles] I cannot do because of the way I'm made up, or because of the way I think, I don't begrudge that there is someone else who has no issues with that." ^ "Nas, Angela Bassett, and Valerie Jarrett on 'Finding Your Roots'". Genealogy Magazine. Archived from the original on December 2, 2014. Retrieved October 1, 2018. ^ a b Bassett, Angela (2009), pp. 18–19. ^ Bassett, Angela (2009), pp. 23–24. ^ a b Bassett, Angela (2009), pp. 29–31. ^ Holden, Stephen (August 14, 1998). "FILM REVIEW; He Likes Video Game". The New York Times. ^ Newman, Kim (January 1, 2000). "Supernova Review". Empire. ^ Byrge, Duane (May 17, 2008). "Gospel Hill". The Hollywood Reporter. ^ Grobar, Matt (May 21, 2018). 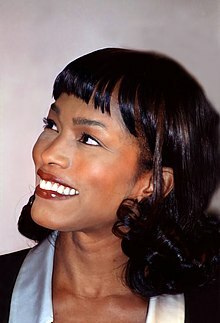 "'9-1-1's Angela Bassett Brings The Heat In First Cop Role". Deadline. Retrieved September 23, 2018. ^ "Angela Bassett Reveals The One Thing She Took From 'Black Panther' Set". Essence. Retrieved September 23, 2018. ^ Malik, Kenan (February 18, 2018). "Black Panther has a burden that no superhero is strong enough to carry | Kenan Malik". the Guardian. Retrieved September 23, 2018. ^ "'Black Panther' And The 'Very Important Black Film'". NPR.org. Retrieved September 23, 2018. 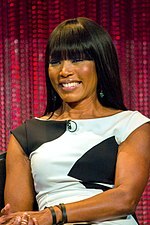 Wikimedia Commons has media related to Angela Bassett.